Well, the depth record fell again. I was out of town for over a week so I could not report the news earlier, and Terry did not want to do so. 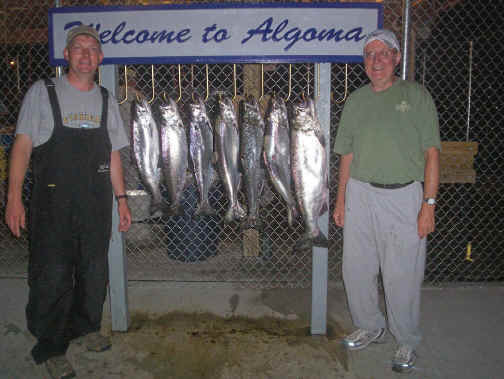 Saturday July 22, 2006 my buddy Tuna, his fiancé Sandy and I wrecked havoc on fish down in the deep off of Algoma. 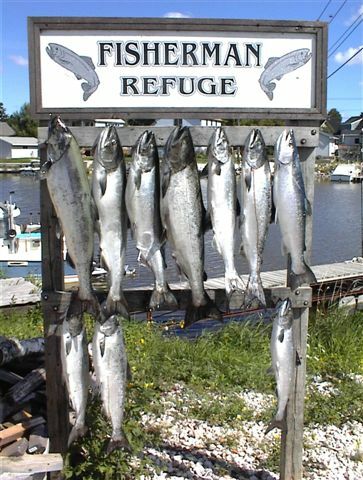 We fished the inside in the morning, which did not pan out much for the fleet. Later in the morning I figured we would go out to the deep water - 300 plus. Between 10:30 am and 1 PM we boated 8 fish that came from 285 feet of cable out to (our known record) 335 feet of cable out. The downriggers are dragging approx 17# cannonballs. The water was flat calm, and the sun was shinning high overhead when this occurred. Sandy caught the largest one: 19.47# with 323 feet of cable out. 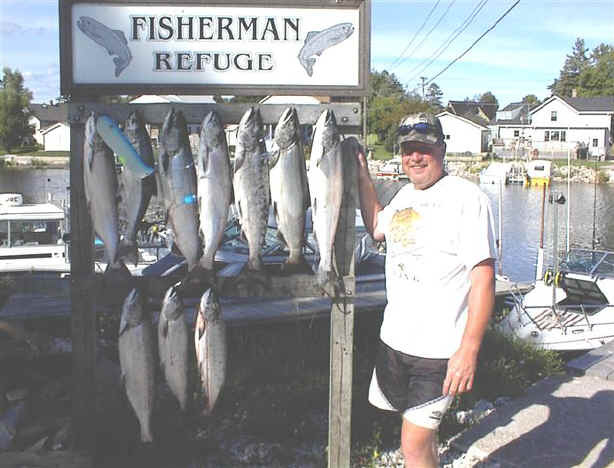 We fished one rigger constantly at 285' and varied the other over 300'. Most of the time we couldn't keep both riggers in the water at the same time. We also took fish in the top 70 feet of the water column with dipseys out. 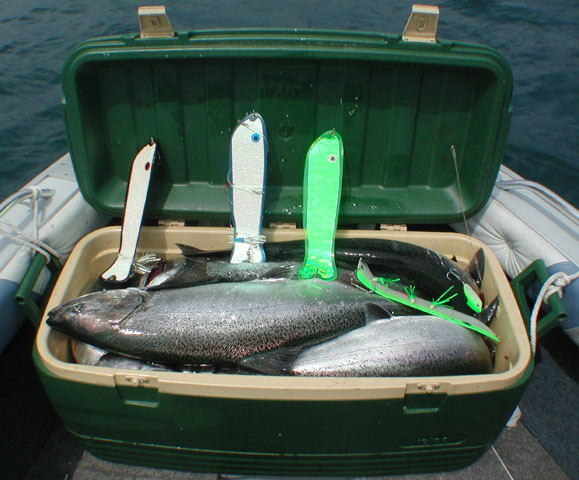 Most fish on dipseys were "bows" although 6# to 7# salmon came on dipseys too. Tuna pointed out at 20 minutes after noon, that life was great as we had a double on the two down deep riggers! The last fish to close out our 15 fish limit (5 each in Wisc.) was a rainbow taken with 285 feet of cable out! Figure that one out! 1/2 hour before that, we caught a rainbow with only 65 feet of dipsey line out. This was not intended as we had been fishing the large ring dipseys out at 181 feet and 222 feet of line. I started to put that dipsey out and we had yet another hit on a deep rigger. I never got back to putting that dipsey out deep. In any case - meat was the answer to a truly memorable trip and set a new standard/record for others to aim for of 335 feet of cable. PS Just for comparison, we put a 12# ball out and down to 285' of cable. It looked like it was laying flat behind the boat compared to the 17# balls that Blue Rhino and Sea Dog made this spring.